From the acclaimed author of Stuffed comes an intimate memoir, written with charm and panache, that juxtaposes two fascinating lives -- the iconoclastic designer Elsa Schiaparelli and the author's own mother -- to explore how a girl fashions herself into a woman. Audrey Morgen Volk, an upper-middle-class New Yorker, was a great beauty and the polished hostess at her family's garment district restaurant. Elsa Schiaparelli -- ''Schiap'' the haute couture designer whose creations shocked the world, blurred the line between fashion and art and believed that everything, even a button, has the potential to delight. Audrey's daughter Patricia read Schiap's autobiography, Shocking Life, at a tender age, and was transformed by it. These two women -- volatile, opinionated, and brilliant each in her own way -- offered Patricia contrasting lessons about womanhood and personal style that allowed her to plot her own course. Moving seamlessly between the Volks' Manhattan and Florida milieu and Schiap's life in Rome and Paris (among friends such as Dalí, Duchamp, and Picasso), Shocked weaves Audrey's traditional notions of domesticity with Schiaparelli's often outrageous ideas into a marvel-filled, meditation on beauty and on being a daughter, sister, and mother, while demonstrating how a single book can change a life. 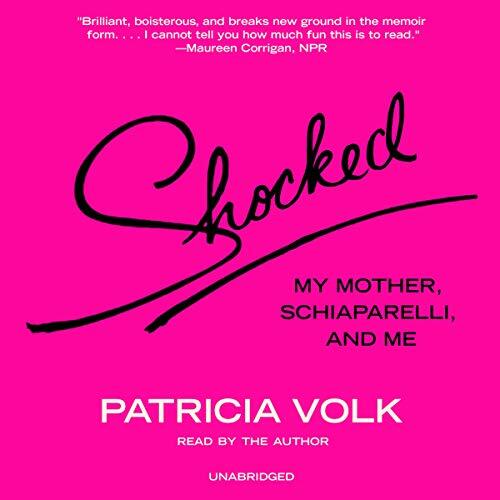 PATRICIA VOLK is the author of the memoir Stuffed: Adventures of a Restaurant Family and four works of fiction. A recipient of a Guggenheim Fellowship, she has written for the New York Times, Atlantic, New Yorker, andPlayboy. She lives in New York City.